I would consider Whispering Pines to be a “better than average” campground. It’s conveniently located about 3 miles west of I-95 exit 2, on RI Route 138. We stayed there for a long weekend last fall. The park is fairly large, with about 180 very large, level, spacious sites. Full hook-ups and pull-thrus are available for larger rigs. The owners were very friendly and made us feel quite welcome. The campground is fairly quiet except that it tends to get noisy at night, especially on weekends… that was the only thing we really minded. Whispering Pines has plenty of amenities and planned activities… a large pool, mini-golf, complementary paddleboats and conoes on a spring-fed pond, shuffle board, tennis, a nice recreation hall, game room, playground, open air pavillion, horseshoes, basketball, softball, and a great planned recreational program that includes swiming lessons. We plan on returning this summer. We stopped here on a trip from Maine to Pennsylvania. Campground is convenient from highway and has a nice wooded atmosphere. The campground needs some updating and could use some landscape work. My site, like many other sites were not weedwacked and the roads around the pool area and J-section should be paved…there is dust everywhere with any vehicle traffic. They could also use a bathroom or outhouse near the pool area! We did have an great time here, it is a very lively campground with great people!! My whole family had a great time, they have a large projection screen in the pavilion that showed the baseball game at night during the week which was nice. The weekend was busy all the time, with something going on everywhere…everyone here has fun here and the people there are the nicest around. I have never seen so many people having fun at a campground. 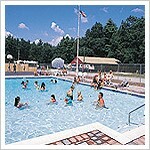 The campground is also very convenient to alot of places (beaches, shopping, sightseeing, golf, etc). Although it wasn’t the pretties campground we went to during our trip, we had the most fun here. My godmother works there. All my family goes there too including me. I go there all the time. I love the Friday and Saturday night dj and bingo. I also like the cabins they are very nice.